Great comfort and price in Athens! Skip the hotel or tiny condo and stay with us for the same money (or less!) and spread out in our roomy, two-story townhouse. Recent Updates! New high quality sleeper sofa mattress! New 12" thick memory foam mattress in rear bedroom. Upgraded linens. New HDTVs in both bedrooms with DVD players. Recent paint, new shower/bath enclosures, plus new washer and dryer, new sleeper sofa and loveseat, and updated kitchen supplies including Keurig K-Cup brewer (as well as a drip coffee maker), crockpot, blender, pots, pans, knives, bakeware, glasses, etc. We keep the condo nice and clean and well equipped. Adjacent to the University of Georgia and convenient to downtown Athens, our townhouse is kept very clean. Quiet, overlooking open space (UGA Golf Course.) Right on the UGA bus route - bus #12 runs about every 15 minutes. Ample parking. Small, well maintained complex of four brick buildings. The complex common areas and grounds are always in top condition. Two bedrooms upstairs, each with full private bath and queen bed. Main floor has half bath, large den/dining area with sleeper sofa, and full kitchen with all expected amenities, private deck, and washer/dryer. We look after every detail often missing at other rentals. We'll make sure there is fresh soap in the bathrooms, plenty of towels and washcloths, paper products, blankets, etc. Enjoy a full kitchen, private washer and dryer, multiple bathrooms, and lots and lots of space compared to a hotel room! Feel free to bring food, beverages, etc. The condo includes silverware, plates, bowls, cups, glasses and so forth, as well as a coffee maker (Keurig and drip), toaster, microwave, can opener, cooking utensils, refrigerator, and things like that. High quality (KitchenAide & Cuisinart) pots/pans/knives/bakeware/utensils. If you find anything missing, let us know and we'll get it there as soon as possible! A great home away from home for University of Georgia visits, such as freshman orientation, parent's weekends, Greek activities, football camp, football and basketball games, baseball, golf, and lacrosse or any time you need to visit your kids or friends at UGA. Also great accommodations for those popular Athens weddings and concerts! We respond very quickly to inquiries and are very responsive to our guests. Use the inquiry form right here on this page, or feel free to give us a call. Leave a message if we don't answer and we'll return your call as soon as possible. Our daughter enjoyed living in this condo during her time at the University of Georgia. We're sure you will enjoy your stay here as well, and we'll always take the extra steps to make sure everything is right. HD television and HD cable service provided plus Blu-ray player. We are using a professional cleaning service that does an outstanding job and understands they are our most important partner! They stand behind their work and will come out and fix anything if it's not clean. No one knows the Vacation Rental by Owner business better than we do. We are fortunate enough to have been a part of VRBO from the early days, and are honored to host you in our vacation home. Location to UGA (University of Georgia) and its activities. Athens is also home to world renowned restaurants, music, and other venues. Quiet, roomy, terrific location, no hotel hassle, easy parking, comfortable accommodations. 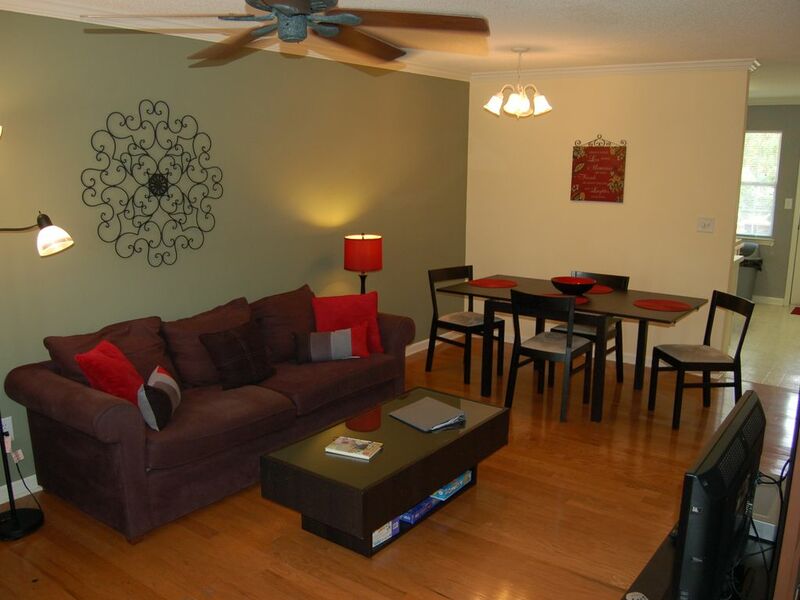 Adjacent to the University of Georgia, easy access to Sanford Stadium, Stegeman Coliseum, and downtown Athens. Overlooks UGA Golf Course and Agriculture School farm. Various board games on site in the living area.